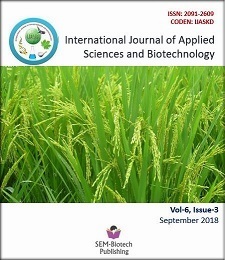 Rice (Oryza sativa L.) being the most important staple crop of Nepal its production and productivity is significantly reduced by old-aged seedling transplantation and imbalanced nitrogen, phosphorus and potassium application. A field experiment was conducted at Sundarbazar, Lamjung to evaluate the performance of 38 days old US-312 hybrid rice seedling under fully rain-fed condition with six precision nutrient management practices [Nutrient Expert® -Rice (NE) recommendation, Farmers Fertilizer Practices (FFP); Government Recommendation (GR); Leaf Color Chart (LCC) N and FFP (P & K); NE (N) and FFP (P & K); and LCC (N) and NE (P & K) replicated four times in RCBD design during July to December, 2017. The statistical results showed that there was a significant difference between the treatments in terms of plant height( 105.38cm),leaf area index(4.26), crop growth rate (3.55),effective tillers m-2(374.25), tiller panicle conversion index (94.93%), panicle length (25.31cm), panicle weight (4.25g), fertility (82.35%), yield at 14% moisture (5.79t/ha), straw yield (7.96t/ha), net and gross revenues (Rs122503.1 and Rs272337/ha), B:C ratio (1.81), partial factor productivity(0.958) and total factor productivity (0.091).The grain yield increased by 37.62% in NE-Rice recommendation over the FFP, more than the NE estimated attainable yields (5.5t/ha) that signified further validation of Nutrient Expert –Rice Model under the mid-hill agro-ecological region of central Nepal.